This Pub model sports a blue anodized aluminum handle and a stonewashed sheepsfoot blade. Designed by Belarussian custom knife-maker Dmitry Sinkevich, the Kershaw Pub offers unique style and handy EDC tool for any occasion. In addition to the modified sheepsfoot blade, the Pub is equipped with a bottle opener, flat-head screwdriver, and an ample 1" key-chain attachment. 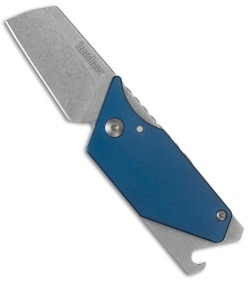 Anodized aluminum handles over a stainless steel frame provide a sturdy framework for the blade. 8Cr13MoV blade steel offers excellent edge retention and corrosion resistance. Large 1" keychain attachment slips easily onto any key-ring for comfortable carry. Bought on sale because is looked nice and unique. It is a good looking and well made knife but I haven't used it as much as I thought. It's a little to big for my carry on a keychain in my pocket (I have Kershaw Cinder for that) but without a pocket clip it doesn't carry well that way either. I do like the design and it was pretty sharp when it arrived. Fit and finish was good. I just need to find the niche in my rotation for this knife. If you need a small knife that is light and good for times you don't have a knife, look no farther. My keys go with me everywhere, and some mornings I forget my regular EDC, this thing has come in handy more times than I can count. The small profile of the knife limits the usability sometimes, but THIS ISN'T MEANT TO TAKE PLACE OF A FULL-SIZED KNIFE. It thrives doing small cutting tasks such as tape, boxes, tags, zip ties, etc... The carabiner is incorporated into the tang of the blade and makes it easy to attach anywhere, and once it is folded open, the tang is held securely beneath my palm, despite having a friction lock, I have had no issues with it closing on my fingers. It took me a while to get opening and closing down, but I can now easily operate one handed. The screwdriver is too wide and thin for most slotted screws if found, but it works excellent for prying. 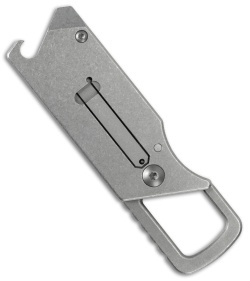 The bottle opener works but isn't the best. All in all, I would totally recommend this as a backup knife to keep handy. I love mine. I am a female with small hands. Handle is short and very flat. It is almost too short even for me. Color: classy metallic blue, better than picture. Screwdriver tip is blunt, so as not to injure hand when using knife blade. Can be used for light duty prying. Two handed opening. The loop hook is the tang and pivots the blade open. If your thumb presses on backside of blade when not cutting, the blade tilts and tang lifts against base of thumb. Thumb keeps blade from closing on your fingers. No locking mechanism for blade. This truly is a pub use knife. Not for camping. Not for whittling. Best thumb position is 1/2 on blade back and 1/2 on tang jimping.